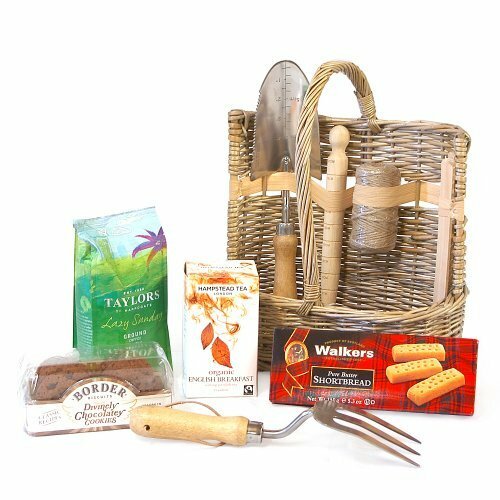 A luxury wicker garden tool basket with a carry handle and tools including: Deluxe Pinewood & Stainless Steel Fork, Deluxe Pinewood & Stainless Steel Trowel, Pinewood Garden Markers 5 pcs, Garden String 50 Meters, Pinewood Garden Measuring Dibber. Comes complete with Organic Hampstead English Breakfast Tea, Taylors of Harrogate Ground Coffee, Walkers Shortbread Fingers, Border Biscuits. View our other products for sale for more luxury hampers and personalised gifts. Standard delivery £6.95, Expedited £10.95.